There are so many things that I’m proud of and that I take credit for… and when I think that I’ve accomplished them by my own effort, I grow prideful, then comfortable, then complacent. When I’m comfortable and complacent, I’m serving only myself, so everything I do passes away like vapor in the wind. I want the things I do to have an impact on the people I love and the world around me. I want the things I do to bless you and please you. So, God, I want to look for and find the ways you and others have helped me. Make me truly grateful for the gifts I’ve received. And as I focus on gratitude, I will forget my pride and forget those things I take credit for. I want to run after Christ, to see more as he does, to choose more as he does, and to live more as he does. Help me focus on that, God, so that I continue to grow, mature, and look more like Jesus. I don’t want to be focused on myself, so I will keep my eyes are on Christ and on you. Help me to gently and consistently turn my eyes back to you. I want to take hold of everything you have for me, everything Christ set me free to grab hold of. I’m moving forward, following you, trusting that you will be with me every step of the way. It’s exciting to think of all that lies ahead, but it can be frightening, as well. I will trust you; help me trust you. I will follow you; help me follow you. You created me as new life when you raised me in Christ. And as I move forward, you will keep making all things in me new. Thank you, God! Thank you! Please help me embrace the new me you are constantly creating. I value many things. I value much in my life: desires I have to do good things, actions I take that seem successful, and objects I have and those I have yet to acquire. But if I could gather everything I’m proud of, every good thing I’ve done, and every success I can find, they would be a pile of manure next to the pure brilliance of the diamond that is your son, Jesus. Help me to make you my goal! Help me to want nothing in this world more than I want to be with you, know you, and love you. I love you passionately! But I make selfish, short-sighted, and misdirected decisions so often. Thank you for loving me faithfully and graciously even when I do so. Please bring me back to yourself and strengthen my faithfulness to you by helping me see and truly understand your faithfulness and your love poured out for me. The deeper you take that message into my heart and mind, the more it will pour out of my life and help others. Jesus is the alpha and the omega; the a and the z; the beginning and the end; the whole enchilada; the whole kit and kaboodle; the big kahuna; the one who is, who was, and who is to come; the one through whom all was created and the one who will bring creation back to its fullness and completion; he is from everlasting to everlasting. Jesus is the visionary and the finisher. He’s the author and finisher of our faith. Jesus, you created me. You sustain me. You complete me. You built me, fashioned me with your own hands. Help me to grasp this, to understand how involved and careful you were as you chose the way you would create me, how you carefully considered and chose each attribute, every trait, each gift, and then carefully measured the exact amounts and combined them perfectly to make me who I am. You sustain me, giving me every breath and every heartbeat and every blink I need today. You give me the energy to think and work, to decide and act, to move and to be still. You give me rest at the end of every long day, and you wake me up again to live another day. Help me to grasp just how deeply you are involved in all the life functions I take completely for granted. You complete me. You pick up where I leave off in every area. Where I can’t make change stick, you bring me lasting change. Where I can’t get healthy, you bring healing. Where I can’t pay the price for my wrong, you pay the penalty for me. Where I am dead, you bring life. Where I’m hopeless, you bring freedom and victory. Help me to grasp just how powerful and willing you are to be all I need and more. I want to know just how far your reach is in my life; help me see how you created me, help me see how you are at work now; help me see how you are the one who brings completion and fulfillment in my life. Thank you, Lord, for being my all in all. Thank you for being my creator, sustainer, and finisher. Thank you for coming to where I live to pull me out of my mess and give me life! You are my everything, and you are worthy to be praised! Thank you for giving me a sound mind and a good heart! Thank you for giving me your son, the Truth, and for always speaking truth to me. Help me to always know and remember that my belief does not make an idea truth. No matter how believable a lie seems, it is no more true than it ever was. Help me to see the nugget of truth tucked at the center of every lie, but help me unwrap it and throw away all the lies that surrounded it. I know that what I think determines what I feel. And what I feel determines what I do. So I am desperate to think right so that I’ll naturally do right. So many times, though, I feel like my thoughts and my emotions are out of my control, that they come and my only option is to exist in them. The truth, Father, is that my thoughts can be under my control. They exist in me, and I can be in charge of them. In fact, I should, and it’s only right that I be in control of them. You gave me life so that I could live powerfully in victory. Through your grace and power, I will be in charge of them. Help me be aware and vigilant to recognize untruth when it comes into my mind and heart. Help me develop perseverance in taking my thoughts captive so that I can test them to see if they are of you or not. Help me learn discernment, and give me the strength and the courage to replace every untruth with truth. What is one lie I am believing that I can work to replace this week, Father? What thought, image, or scripture do you want me to put in its place? Truth sets me free. Every truth I keep in mind grants me another degree of freedom. I want every bit of the freedom you purchased for me, God, so help me to take hold of the truth and never let it go. In the name of your son, Jesus -- Truth, amen. The colorful lights of Christmas are glorious and beautiful and intriguing! I love to look at them because they bring me so much joy in this season. But God, they are not the true light; your son is. He came into our darkness to bring us sight, warmth, and life. Let me look past the commercial lights this Christmas season. Their bright colors grab at my attention. But let me look past the glitter and the flash, which are small and temporary, so I can truly see the light of your love which is deep, powerful, and eternal. I want to see you. More than this, God, let me be a conduit of your true light so that other see you when they look at me. Your light in my life will show the good things you’re growing in me. It will also reveal the things I’m not proud of, things I wish would remain hidden. I want to be bold and courageous to run toward your light, not away from it. I want the healing and redemption your light brings. Help me to have faith that your light will not destroy me or humiliate me by revealing those things, but will actually destroy those things, heal me, and set me free. In the name of Jesus, the Light of the World, Amen. When I put a few quarters in the vending machine, I expect my prize to fall immediately into the bin so I can grab it. I confess and agree with you -- sometimes I’ve treated you like a vending machine. I have talked to you, done things for you, or done things for others expecting you to drop a reward into my hands. Worse, I’ve measured your love for me by how much of what I want you give to me. And even worse, I’ve believed the lie that you don’t love me when things don’t go the way I want and when your answer to me isn’t, “Yes.” I have also judged others by looking at their difficulties and concluding that their challenges are the result of problems in their relationship with you or a lack of faith in their heart. God, I’m so sorry I’ve hurt and offended you. These things I’ve done grieve my heart, so I turn from them and ask you to help me stay far from these temptations. Help me instead to treat you like my loving parent, like my hero, and like my best friend. Help me to accept your “yes” humbly, your “maybe” peacefully, and your “no” trustingly. I want to know that your love for me is the same when your provision of earthly things is plentiful and when it’s meager. I want to rest, knowing your love is deep, constant, and true, no matter whether I’m getting what I want or not. Please help me to recognize the truth when it comes to my ears and help me discern untruth and filter it out before it takes root in my heart. I love you. Thank you for your loving “yes” and your loving “no” when I ask for things -- you know best, and I trust you. In your son’s name I pray, amen. For my thoughts are not your thoughts, neither are your ways my ways,” declares the Lord. Thank you that you have a purpose for me! Not only that, but you planned out my path and you planned every good thing for me to do before I was even conceived. You saw the best in me from the beginning. And you see the best in me now. Even though the enemy has worked to damage, imprison, and even destroy me, you have worked to rescue, redeem, and restore me. You repair my heart. You release me from my chains. You raise me as your own. The world tells me I'm ugly, but you see my beauty. The world tells me I'm worthless, but you treasure me. The world tells me I'm filthy with shame, but you wash me clean. The world tells me I'm powerless, but you see my ability and possibility. Please help me take the words of the world and the thoughts of the enemy captive so that my mind will be clean, sound, and dedicated to you. Help me to know, to believe, and to live in the truth. How do you see me, God? Help me see myself the way you see me. Help me know the way you love me. And then help me see others and love others as you do. In Jesus' name, amen. Father, in every area of my life and in every circumstance where I teach, counsel, or guide others, help me to be humble and teachable because I know more is expected of the teacher than the student. I’m learning that my tongue -- the words I speak and the tone in which I speak them -- is the thermometer that reveals the health of my heart. I can’t control my tongue consistently or completely, Lord, but I need to grow and improve because it’s such a powerful part of me. Help me to be aware, be slow to speak, and be intentional about speaking words of life and love.Help me to say to others the things I long to hear. I want to speak on your behalf, not my own. I want my words to be sweet water, not serpent venom. I confess and agree with you that I have used my tongue to curse others and to break people down. Those people bear your image, so I have used my tongue to curse and offend you. I turn from that choice now and ask you to lead me and help me walk in a new direction. I know that what’s in my heart overflows out of my mouth, so in order for my mouth to be a fountain of fresh, living water, I need you to work deeply in my heart and make it a place full of your love. I can’t do this without you. Please create a clean heart in me so that my words give you joy and bring life to those around me. From Sunday's sermon, "Faith in your heart, is evident through the fruit of your works." "Father, I claim to have faith! Would you please show me one way that my faith has become real and can be seen in something I have done? Thank you for helping me to do that, and thank you for sharing that evidence of my living faith. And now, would you please show me a way I can feed and clothe, encourage and sustain you… by feeding and clothing, encouraging and sustaining those around me? Grow my living faith, please God, by helping me to act and work in love." Would you be willing to write down what God shows you about how you are already acting out the faith that is in you? And then write down anything he shows you about what new thing you can do? Does this dovetail at all with what he showed you last week about favoritism, judgment, and mercy? 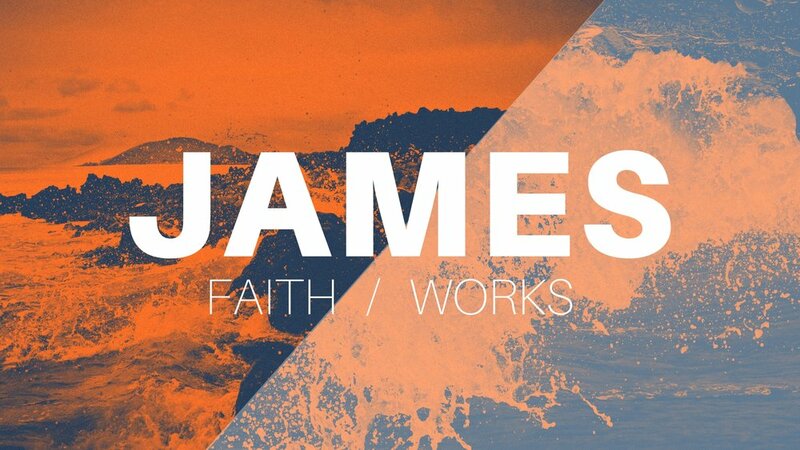 Yesterday, Pastor Trey continued our sermon series "Faith/Works" from the book of James, on Favoritism. Please take a moment to read James 2:1-12, and reflect on this prayer. Father, it isn’t a question of whether I show favoritism or whether I judge people by their appearance; it’s a question of which groups I do this to. Please open my eyes to it! Please give me the courage to face the truth. Reveal to me the reason which lies inside of me that I favor one group and judge another. Please heal the wound, dispel the fear, and dig up the root of pride so that my judgment and favoritism are starved and die out. Open my eyes to the truth about the people around me -- their value, their hopes and desires, their struggles. Help me to see their lives as precious, just as you do. Help me to engage with those different from me so I can get a new perspective. Please open my ears to the words, attitude, and tone voice I use which reveal my favoritism and judgment of others. You loved me, God, and you didn’t judge me by my physical appearance. Thank you! Help me be more like you. Please show me one way I can genuinely love without favoritism in my home, at work, in traffic, or at the store. I confess -- I agree with you -- that I’m a lawbreaker. I have shown favoritism and have judged those around me. I hand you that sin and I’ll watch to see what you do with it. Thank you for forgiving me and helping me to turn away from this into freedom! Please show me my “neighbor” who needs my love and acceptance today. And please fill my heart with your love, not my finicky, emotion-based, wimpy human love, but rather your real, deep, eternal-minded, action love. Please show me one thing I can do to love that person. God, I need your mercy now, and when I stand before you when my life is done, I’ll want and need it even more. Help me to show your kind of crazy, extravagant mercy to those around me. Let mercy triumph over judgment in my heart! I desperately want to be merciful to my family, my coworkers, my neighbors, and myself. God, help me to hold on to your glory so that I’m not dazzled or disgusted by the people around me. Help me keep my eyes and the eyes of my heart on you and on those you love. May you Love your neighbor as yourself this week because Faith Loves. Alice and I recently spent our entire weekend doing a deep cleaning of our home. This intense spring-cleaning included, reorganizing all of our drawers, closets and cabinets while also re-organizing our garage and shed. As you can imagine, this was a grueling ordeal. However, because of the busyness of our lives, we knew that there were some things that needed to be reorganized in our home. That’s kind of what Lent is, it’s a spring-cleaning… but for the soul. It’s a season of the Christian year, where we focus on getting our souls in order. What is Lent? The word Lent, comes from the old English wordLenten which means Spring. It is the forty days before Easter where we prepare our hearts and souls for the death, burial and resurrection of Jesus. It is a time of prayer, reflection and fasting. When does Lent begin/end? Lent begins, this year on Wednesday, March 1st (Ash Wednesday) and concludes on Sunday, April 13th (Easter). Lent POINTS us back to Jesus. Lent reminds us of our desperate need for a Jesus. Lent is a time of fasting. We fast in order to put our stomach where our souls should be. Lent invites us to reflect on our sinful nature, and our need for forgiveness. How can we observe Lent? There are many different ways to observe Lent..
What is Ash Wednesday? Ash Wednesday, the day after Mardi Gras, usually begins with a service where we recognize our mortality, repent of our sins, and return to our loving God. We recognize life as a precious gift from God, and re-turn our lives towards Jesus Christ. We may make resolutions and commit to change our lives over the next forty days so that we might be more like Christ. In an Ash Wednesday service, usually a minister or priest marks the sign of the cross on a person's forehead with ashes. Why Ashes? In Jewish and Christian history, ashes are a sign of mortality and repentance. Mortality, because when we die, our bodies eventually decompose and we become dust/dirt/ash/whatever. Repentance, because long ago, when people felt remorse for something they did, they would put ashes on their head and wear "sackcloth" (scratchy clothing) to remind them that sin is pretty uncomfortable and leads to a sort of death of the spirit. This was their way of confessing their sins and asking for forgiveness. Why should I fast? At Jesus' baptism the sky split open, the Spirit of God, which looked like a dove, descended and landed on Jesus, and a voice from heaven said, "This is my Son, My Beloved, with whom I am pleased." Afterward, as told in Matthew 4:1-11, Jesus was sent into the wilderness by the Spirit. Where he fasted and prayed for 40 days. During his time there he was tempted by Satan and found clarity and strength to resist temptation. Afterwards, he was ready to begin his ministry. Also, please consider joining us for our Ash Wednesday service, on Wednesday, March 1st, 7:00pm at Christ’s Haven Gymnasium. Dr King has played a significant role in my life ever since I can remember. In fact, I recall first being introduced to the teachings of Martin in my Elementary school History class. As a result of hearing his message of unity, peace and justice, I decided that Dr. King would be the topic of my 4th grade history project. Join us Monday, January 16th from 7:00-8:00PM on the steps of the Keller Town Hall (1100 Bear Creek Pkwy. Keller, TX) for "Speech on the steps" where we will gather to watch the 17 minute "I have a dream" speech and to pray for unity and peace for the city of Keller and surrounding cities, our country and our world. FREE HOT CHOCOLATE! Learn more about events that we will be hosting in 2017 that promote unity HERE! Have you gone into Target or Walmart recently? If Yes, then you know that the Christmas Decorations are out and up everywhere you look. Radio stations are even beginning to transition over to Christmas songs. Whether it feels "too soon" to you or not, the season of Advent is among us. This Sunday, November 27th is the official first day of Advent. Since we are a church of people from many different backgrounds, some of you may be unfamiliar with Advent and what it represents. We'd love to share with you the wonderful background and ways to observe Advent to help bring clarity to the questions you might have. Throughout our Advent sermon series, (Which will begin Dec 4th) we hope you have a meaningful Christ-centered season as our hearts prepare Him room. What is Advent? The word Advent comes from the Latin word Adventus, which means “coming.” Advent is approximately four weeks long, and is best defined as a season of preparing for the celebration of God taking on flesh and “coming” to dwell among us. Also, during this time we look forward to the second coming of Jesus as we celebrate His first coming: Advent is to Christmas what Lent is to Easter. It is a time of repentance and abstinence. Why do we observe Advent? You will notice that the word Advent is not in the bible, nor is there a biblical command that we must participate in Advent. Therefore, it would be easy to conclude that we don’t have to participate in Advent. That would be correct! However, here are a few reasons why The Well Church Keller choses to observe Advent…. 1. Advent POINTS us back to Jesus during a time when everything else is POINTING us away from Jesus. 2. Advent reminds us of our desperate need of a savior. 3. Advent is a time of waiting on Jesus. Waiting is a characteristic that our society doesn’t teach us, however it is a trait that we must possess as Christians. 4. Advent invites us to reflect on Christ’s Incarnation. 5. Advent is an intentional time this season to read, reflect and meditate on scriptures that remind us of the first and second coming of Jesus. How can we observe Advent? There are many different ways to observe Advent. 2. Follow an Advent Calendar. 4. Listen to Advent music. What’s up with the candles at church? As you probably noticed this Sunday, there was a wreath with 4 purple candles encircling it, and a centered white candle. This is traditionally referred to as an Advent wreath. The four candles represent Hope, Peace, Love and Joy and are lit each subsequent week within Advent. The white candle in the center, which represents Christ, is lit on Christmas day Sunday, December 25th. Join us at The Well Church Keller, in a season of Waiting, Expectancy, Anticipation, Soul Searching, Fasting, Praying, Preparing and Centering our hearts and minds on the “Adventus” of Jesus. As many of you know, youth ministry has a very special place in my heart. Before I became a Lead Pastor, I worked in youth ministry for 7+ years. Not to mention, it was as a youth at my childhood church that I fell in love with ministry and it was where God began to plant in my heart, a desire for a life of ministry. One thing I learned in my years in youth ministry, is that youth desperately NEED to not only hear truth from their parents, but from other adults who love Jesus, and love students. With that being said, we are so excited to launch our WellHouse Youth ministry THIS WEEK. We will be having a Meet N' Greet THIS WEDNESDAY, 6:30-7:30pm at Bosses Pizza in Keller (201 N. Main Street. Keller, TX. 76248). If your son/ daughter is currently in Middle School (6th-8th grade) or High School (9th-12th grade) we would love for them to join us for this exciting event. We have a team of middle school leaders and high school leaders eager to pour into your youth. If you have additional questions about Wellhouse Youth, feel free to contact us at info@thewellchurchkeller.org. What is Palm Sunday? Palm Sunday is the final Sunday of Lent and leads us into Holy Week. This day commemorates Jesus' arrival into Jerusalem, days before he was crucified where believers met him and laid palm branches in his path as a symbol of welcome, victory, and peace, showing great respect. The bible tells us Christ arrived in Jerusalem upon a donkey (Matthew 21:5). This is important as we recognize this sign of humility, instead of arriving on a steed such as those in war. Christ's example of humility was that he "7 emptied himself, by taking the form of a servant, being born in the likeness of men. 8 And being found in human form, he humbled himself by becoming obedient to the point of death, even death on a cross," see Philippians 2:5-11. Easter Sunday, the end of Holy Week, we celebrate the first Easter when Christ rose from the dead and paid the debt for the sins of the world; for yours and for mine. Would you join us March 27th as we celebrate together at The Well Church Keller? Join us this Easter Sunday. Brunch immediately to follow. Christ's Haven 4200 Keller-Haslet Road, Keller, TX 76244. What is Lent? The word Lent, comes from the old English word Lenten which means Spring. It is the forty days before Easter where we prepare our hearts and souls for the death, burial and resurrection of Jesus. It is a time of prayer, reflection and fasting. When does Lent begin/end? Lent begins, this year on Wednesday, February 10th (Ash Wednesday) and concludes on Sunday, March 27th (Easter). Why should I fast? At Jesus' baptism the sky split open, the Spirit of God, which looked like a dove, descended and landed on Jesus, and a voice from heaven said, "This is my Son, My Beloved, with whom I am pleased." Afterward, as told in Matthew 4:1-11, Jesus was sent into the wilderness by the Spirit. Where he fasted and prayed for 40 days. During his time there he was tempted by Satan and found clarity and strength to resist temptation. Afterwards, he was ready to begin his ministry. As a church we are participating in a 40-day fast. For more information on fast, click here. Also, please consider joining us for our Ash Wednesday service, on Wednesday, February 10th, 7:00pm at Christ’s Haven Gymnasium. For more information on Ash Wednesday service, click here. It’s the third Monday in January. Your kids are probably out of school, you might have gotten the day off from work – you definitely aren’t getting any mail. For many of us, a quick glance at the calendar is required to remember that this holiday is Martin Luther King Jr. (MLK) Day. Holidays are funny in that way. They expose our natural tendency to get wrapped up in the here and now, in the little things that impact our own personal fiefdoms. We tend to focus on the secondary aspects of the occasion rather than taking the time to reflect on the genesis of the holiday. Christmas is the classic example. There are family visits to facilitate, meals to prepare, activities to plan, gifts to buy and finances to worry over. We lose sight of the “reason for the season.” In my experience, the church has done an admirable job of combating this phenomenon. We are constantly reminded that Christmas is not about lavish, worldly gifts or being the world’s greatest host or hostess, but rather is a time to reflect on God the father sending God the son into the world as the ultimate gift to humanity. Our need to be reminded of the importance of a holiday isn’t something to be ashamed of, but it should be recognized. We all know the old saying – admitting you have a problem is the first step. We are sinful. We are self-absorbed. But, we have a God-given capacity to be thoughtful, to be reverent, to appreciate the accomplishments of those who came before us. This is not to say that the life of MLK should be held as equal to that of Jesus. No man has, or ever will, hold a candle to the perfect man. But MLK Day is momentous in its own right. It is a day set aside in remembrance of the many men and women who pushed the world to uphold the principle that all men are equal under God. With Dr. King as their leader, they fought fire with peace, violence with intellect, discrimination with integration. The non-violent resistance practiced by Dr. King and other civil rights activists serves as one of the strongest examples in the modern era of a Christ-inspired movement ushering in monumental change against great odds. While reflecting on this can remind us of how far we’ve come, it also illuminates how far we’ve left to go. If you’ve any doubt that there is still work to be done, consider that MLK Day was first proposed shortly after Dr. King’s assassination in 1968 but would not be signed into law until 1983 and was not observed until 1986. Even then, the holiday was not officially observed in all 50 states until 2000. That is sobering. But, rather than lament the distance we’ve left to go, God calls on us to stand up and surge forward. Let the accomplishments of Dr. King as well as the strides made by those who came before and after him inspire us to do better. Don’t let MLK Day pass by as just another day off. Hold it up as an example of what we can accomplish when we strive to live like Jesus lived – surrounded by and accepting of men and women of varying ethnicities, beliefs, and walks of life. The Well Church at Keller is striving to do just that. On Monday, January 18, 2016 – MLK Day – the Well Church and the City of Keller collaborated to hold a public viewing of Dr. King’s “I Have a Dream” speech. The Well Church, citizens of Keller and surrounding cities, and Keller City leadership (including the mayor and the chief of police) came together on this near-freezing night to socialize, to celebrate, and to talk about the work that remains to be done. Progress is, more often than not, made one small step at a time. Odds are that you cannot walk out of your front door tomorrow and set right all that is wrong with the world, but you can begin. For many of us, a good first step is to consider what our table looks like. Is it diverse? Is it challenging? Is it open? You don’t have to sell off all of your earthly possessions and move to a third world country in order have an impact or, perhaps more importantly, be impacted. You can make a difference by letting others in. Better yet, don’t just let them in – seek them out and bring them to your table. When I heard that there was not a MLK event planned for the city of Keller, I immediately called the mayor to pitch the idea of hosting one. Join us Monday, January 18th on the steps of the Keller Town Hall (1100 Bear Creek Pkwy. Keller, TX) for "Speech on the steps" where we will gather to watch the 17 minute "I have a dream" speech and to pray for unity and peace for the city of Keller and surrounding cities, our country and our world. FREE HOT CHOCOLATE! We launched our first Advent series Sunday November 29th at The Well Church Keller. Since we are a church of people from many different backgrounds, some of you may be unfamiliar with Advent and what it represents. We'd love to share with you, the wonderful background and ways to celebrate Advent to help bring clarity to the questions you might have. Throughout our Advent series, we hope you have a meaningful Christ-centered season as our hearts prepare Him room. What’s up with the candles at church? As you probably noticed this Sunday, there was a wreath with 4 purple candles encircling it, and a centered white candle. This is traditionally referred to as an Advent wreath. The four candles represent Hope, Peace, Love and Joy and are lit each subsequent week within Advent. The white candle in the center, which represents Christ, is lit on Christmas day (or in our case Sunday, December 27th). We had a phenomenal Launch Team Meeting yesterday. For those of you who were unable to attend, please join us for our June 14th Launch Team Meeting at The Keller Library. We then had a time of connection where Bob Robinson led us in an ice breaker game. Then, Darryl Claiborne gave us our financial update. (Click here for a copy of the packet). Darryl also shared the fundraising campaign called, "Make a Ripple!" This campaign is to help The Well, remain in a healthy financial position. We will be having two monthly fundraising meet and greets, where our pastor and family will meet with families/ friends to share the mission/vision of The Well, and then ask them to consider partnering with The Well through prayer and or financial giving. Following the financial update, Jon Berestecky shared with us our June service opportunity in which we will be helping to meet the needs of some of God's Children in Keller. This event is on Saturday, June 6th from 9-11am (More details to come). After this presentation, Drew Sher shared about the prayer team and how our prayer team will be receiving prayer requests from the team and from our community and someone from the prayer team will be lifting these prayers up on a daily basis. Following Drew, we broke out into our Launch Teams to continue the process of preparing for the launch of The Well Church Of Keller. remember, its never too late to join the team:) Hope to see you next month!